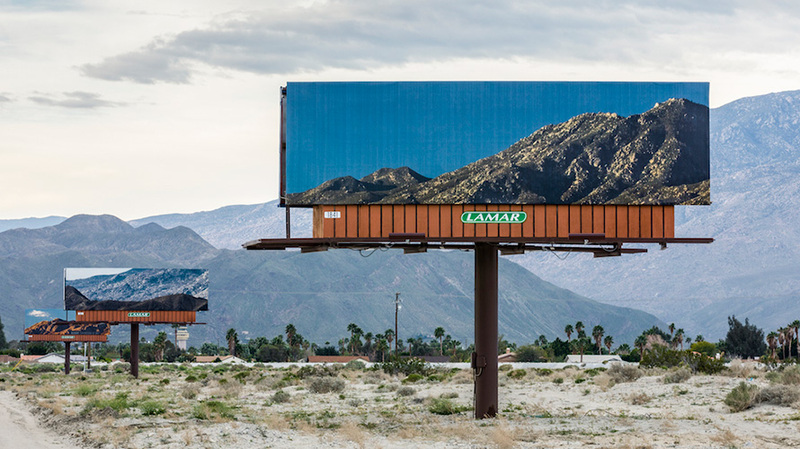 An artist in California is replacing garish billboard ads with nature photos that blend almost perfectly into the surrounding landscapes—because they show the landscapes themselves. Jennifer Bolande’s “Visible Distance/Second Sight” is gracing roadside scenes along Gene Autry Trail and Vista Chino in Palm Springs, California. When a viewer sees the outdoor posters from the right perspective, the large-scale images of the mountains in the distance align with the actual ranges, creating a striking juxtaposition of the virtual image and the real one. Part of a broader “Desert X” exhibition in the area, it’s meant to redirect attention from the advertisement to the natural world depicted in it. It’s been done before, to a degree. As we pointed out in 2015, artist Brian Kane’s work in Massachusetts used trees and stars to similar effect. More broadly, billboards seem to have become a popular medium for fine artists to commandeer in recent years, as they seek to grab drivers’ attention in the same way advertisers do every day, but to a purer end. What might be most intriguing—or perhaps disturbing—about Bolande’s work, though, is that, at least in photos, they arguably look more real than the surroundings themselves. That might suggest an implicit critique of the heavily mediated world in which they appear, and the conditioning of viewers to it—or just be the unintended consequence of seeing reality, and its facsimile, filtered through yet another lens.